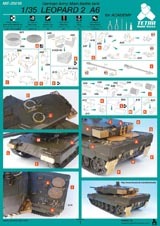 Review sets kindly contributed by Tetra Model Works (also on Facebook). Thanks also for the use of Tetra's own photos from their website. 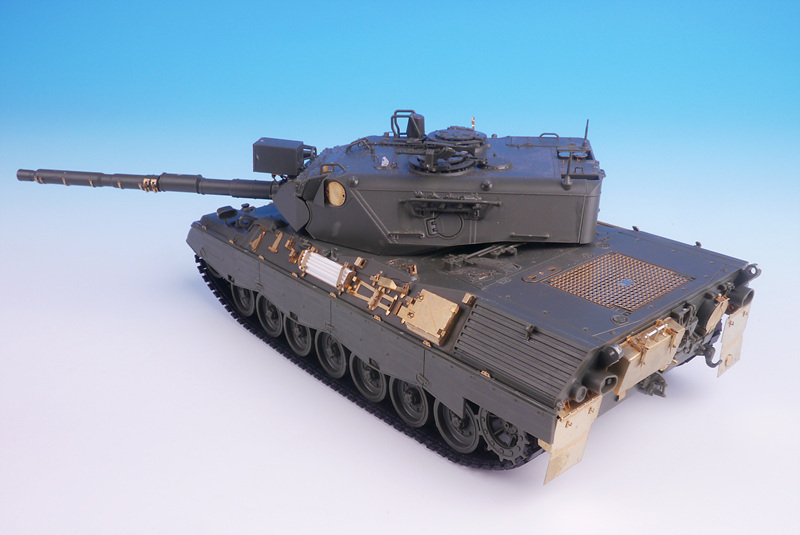 Tetra Model Works - who are they? Tetra are a new name in the world of photo-etch. 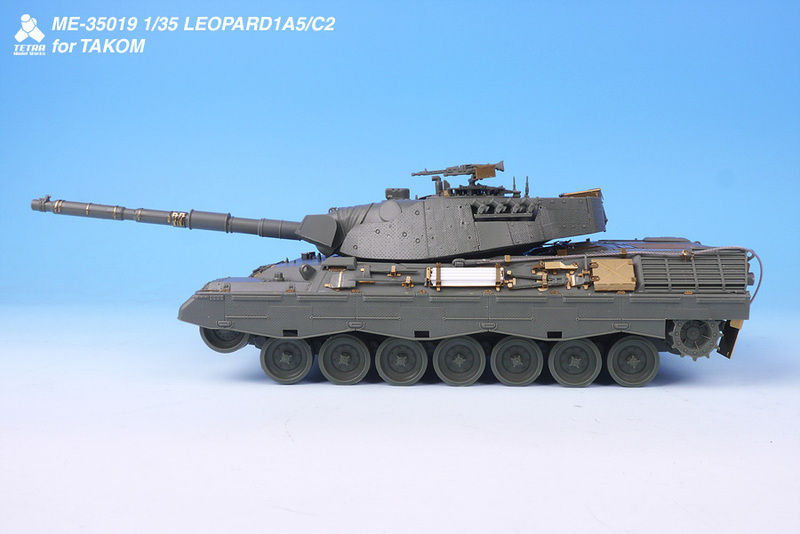 The company, based in South Korea, was established as recently as September 2013 with their first release the following November. 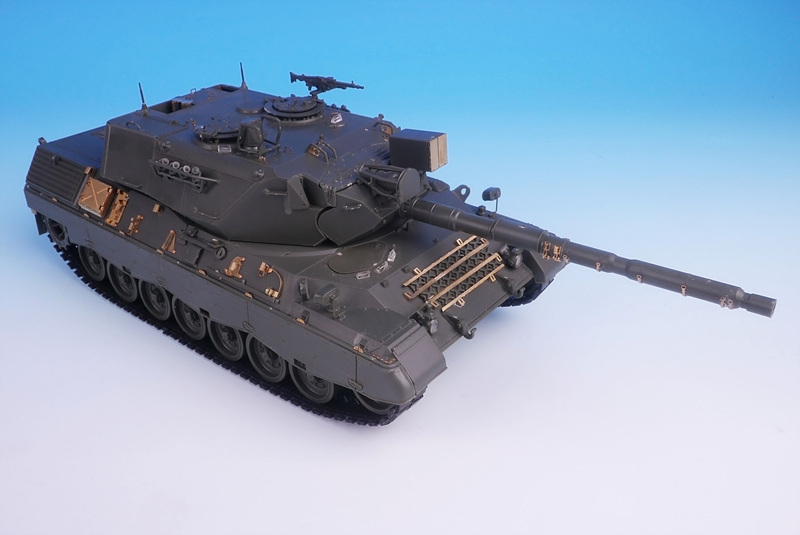 Their range encompasses simple mesh patterns, AFV and ship detail sets, AFV and ship accessories (such as turned aluminium guns), and a small number of aircraft accessories. 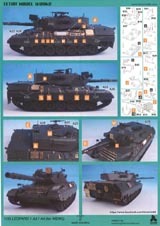 They cater for 1:72 and 1:35 AFVs, 1:200, 1:350, 1:700 ships and 1:32 aircraft. The range is small at the moment, but it is growing steadily, proving the popularity of the items from this small company. The company logo is a Tetrapod which are four-legged concrete 'tripods' used for coastal defences around the world. 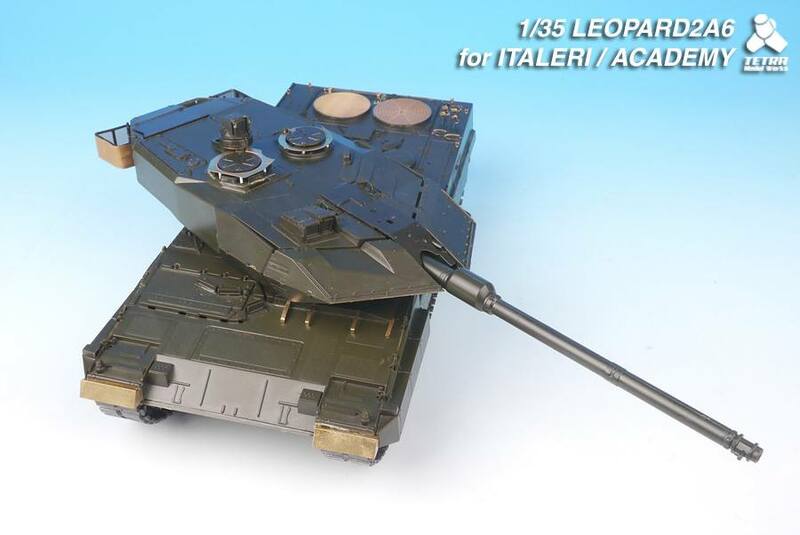 What is the connection is between these and Tetra Model Works? Here is their own answer. "We chose our logo because firstly, our main products are ship-related detail sets, so we chose something related to the sea. Secondly, Tetrapod is a very stable structure which can stand firmly on the ground whichever direction they are placed. We will stand firmly and grow like Tetrapods even though there are lots of changes in the future in the after-market world. Finally, Tetrapods are a beautiful structure and they are necessary to do the job they do. We hope that our products are considered as the most needed detail sets for our customers, not just once but continuously as time passes by." 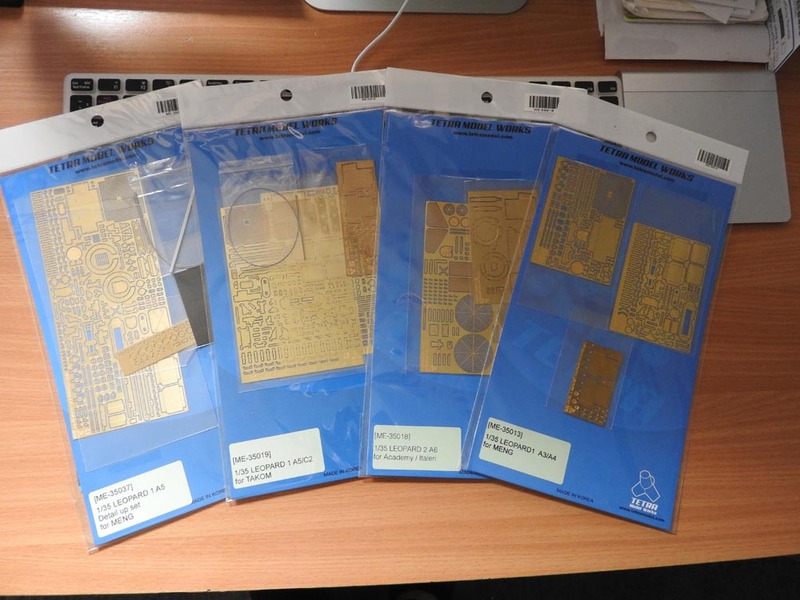 Most of us are used to photo-etch coming in tiny cellophane or zip-lock plastic bags where the etch frets are difficult to remove - and indeed put back - into the bags. Most have simple BW drawings on multiple folded sheets illustrating things like folds/cuts/kit areas to be removed/etc. The Tetra packaging, in my opinion, is somewhat higher class. The tough cellophane bags are all a consistent size of roughly three-quarters A4 and each fret come in individual bags. 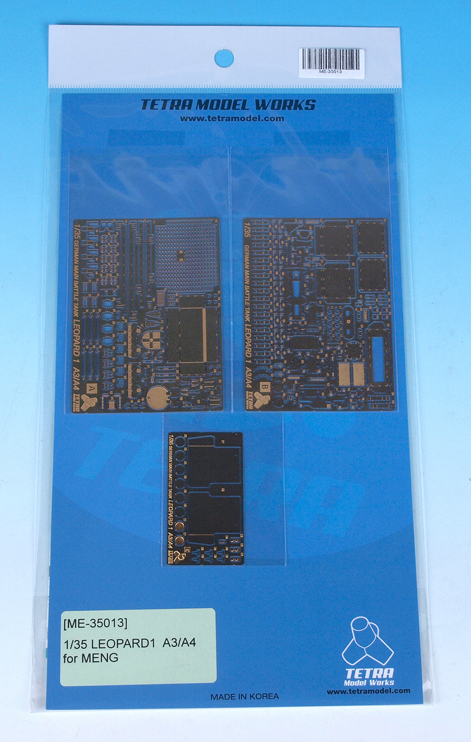 There is a thin card reinforcement, which could be a bit thicker to provide more protection against the frets being bent. 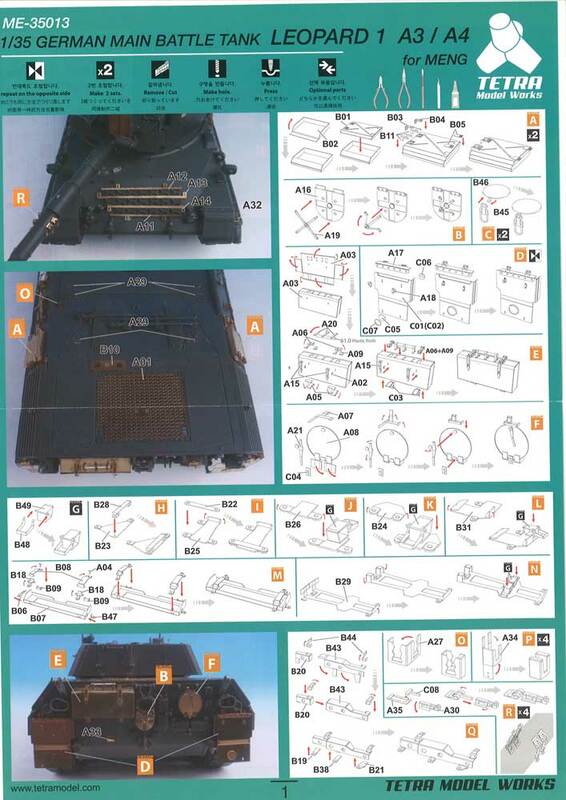 The instructions are all full-colour on two sides of A4, not just with clear drawings, but also clearly annotated colour photos showing exactly where the etch goes on the model. Groups of parts which go together to build a composite part are labelled as letters, and individual parts are labelled by fret numbers. The etch itself comes in different thicknesses so items like mud flaps and cupola rings are much thicker than tool clips and mesh grilles. 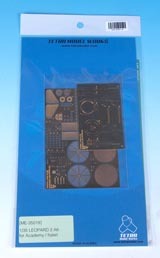 Some sets include wound braid for cabling and plastic rod. In one set there are even real rubber mud flaps!! Taking the sets one by one, starting with the simplest, I have repeated some of the comments in each set where relevant, for the sake of completeness. I am sorry if you think you have read some of this before! 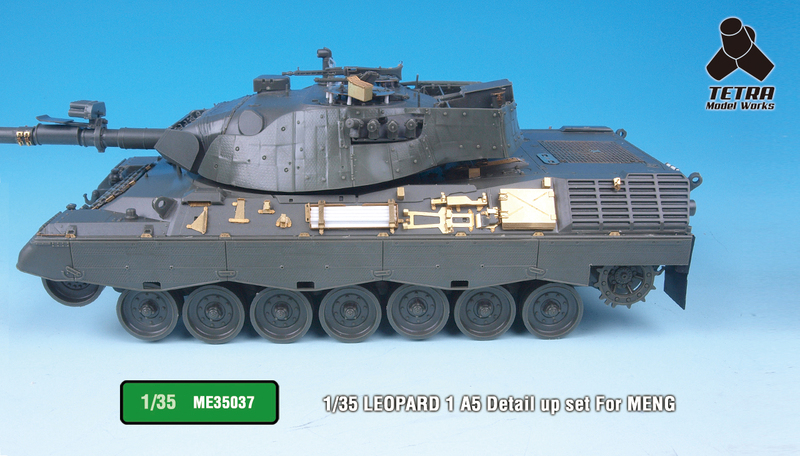 This set is designed for the older Revell Leopard 2A6 model number 3060 (and the Academy equivalent), not the more recent Revell release (03097), though most items should work on both. 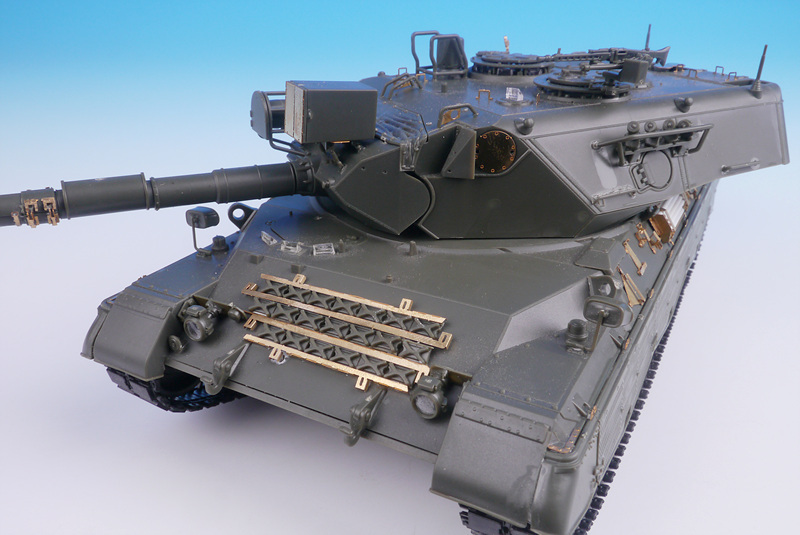 This has just three frets which includes all of the tool clips, rear deck grilles, exhausts, turret basket mesh, cupola rings, front and rear mud/dust flaps, cable reel, convoy 'shield' plus additional brackets on the turret rear. The instructions in my sample had Bradley instructions on the reverse side, obviously a printing error. All the items on the fret are covered on the first side of the instructions so nothing is missing. To use the tool brackets, the kit brackets will have to be carefully removed from both the tools and any mounts/locations of the hull as well, to the tools sourced from somewhere else without any clips. The brackets themselves are simple four sided affairs to which is attached the handle. Looks nice and simple unlike some of the overdone 'working' clips on the market. Positives - This is a simple, practical set, not overly complicated. 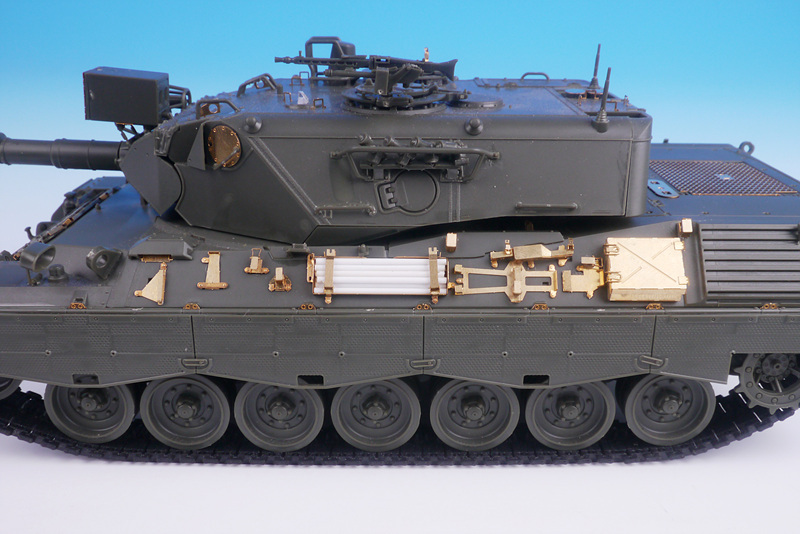 Negatives - The only things I don't like are that the convoy 'shield' is about 20% too large and the flat rings on the bottom layer of the rear deck grilles are flat and too thick. In reality, the circular rings are tubular so I don't think these really work. 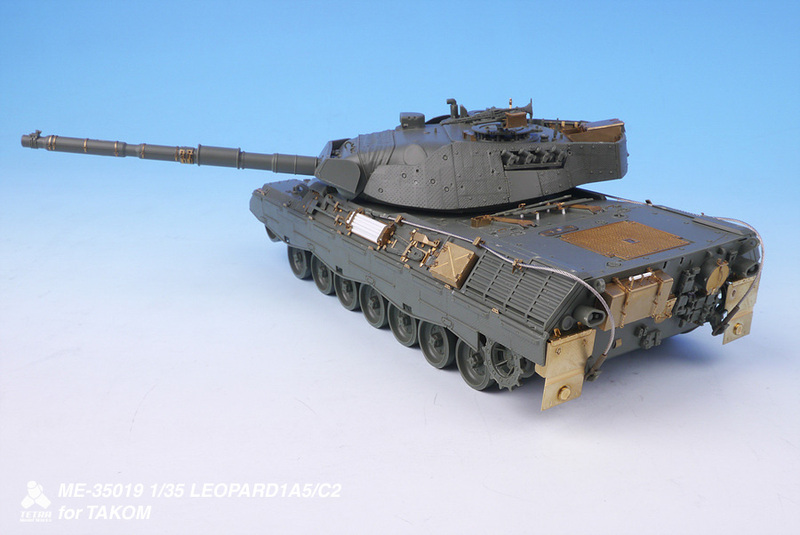 A surprising omission are chains for the smoke launchers - now available from Leopard Workshop as LW027A . Conclusion - A good set, with just what you need for that little bit of extra detailing - much better than some of the over complicated sets on the market. 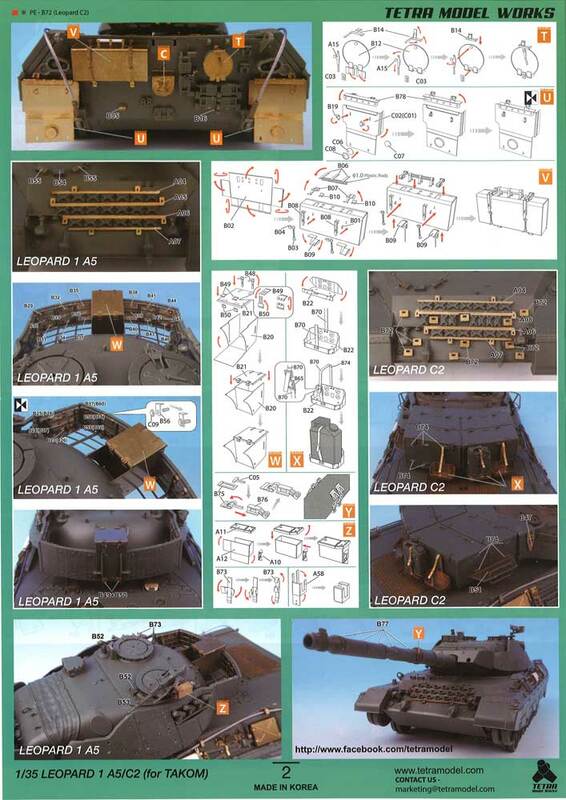 Leopard 1 has a lot more brackets compared to Leopard 2, so this is a more complicated set compared to the first set. 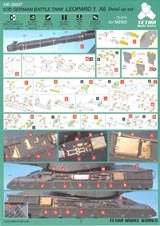 Having said that, this set also has only three frets which includes all of the tool clips, barrel thermal sleeve clips, rear deck grille (lower level), machine gun lock, rear mud flaps, convoy 'shield', hull side and rear tool boxes, grouser racks, searchlight and telephone box doors, rangefinder head cover and some tow cable clips. To use the tool brackets, the kit brackets will have to be carefully removed from both the tools and any mounts/location points of the hull as well, or the tools sourced from somewhere else without any clips. The brackets themselves are simple four sided affairs to which is attached the handle. Looks nice and simple unlike some of the overdone 'working' clips on the market. You will have to supply your own plastic rod for the gun cleaning rods. 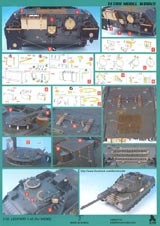 Some of these items look quite involved, particularly the rear hull tool box and those on the sides. 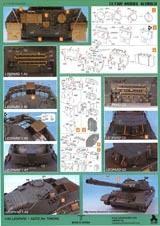 However, just the brackets and clips could be more easily used on the plastic kit parts. The hull side boxes have slots in the folds which will have to be filled, as do the grouser racks - don't like. 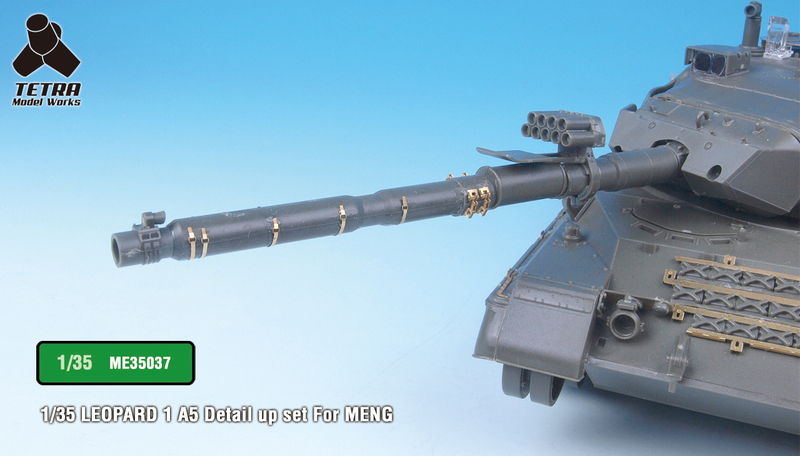 The rear tool box handle (the top one) on the Meng kit is atrocious! 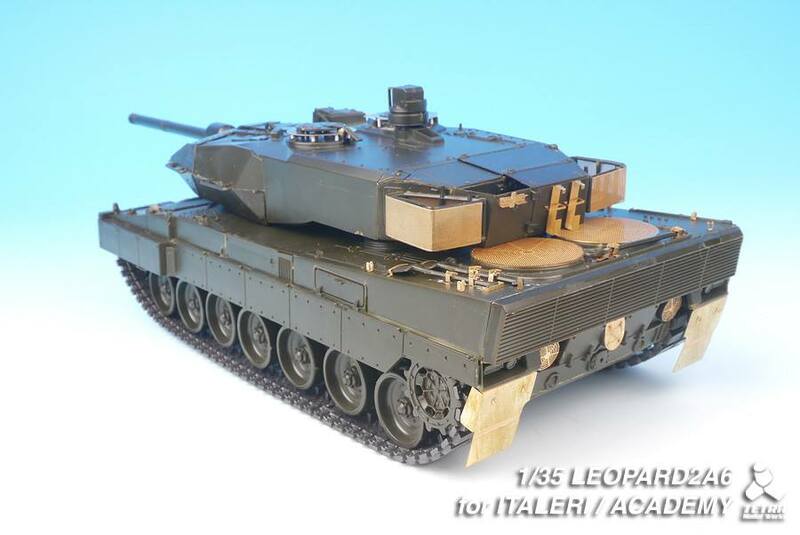 Like the Leopard 2, the convoy 'shield' is about 20% too large even though a different design is used here. I like two of the tow cable cable brackets - groups O and P. Two of the P's and O are all completely missing from the kit. 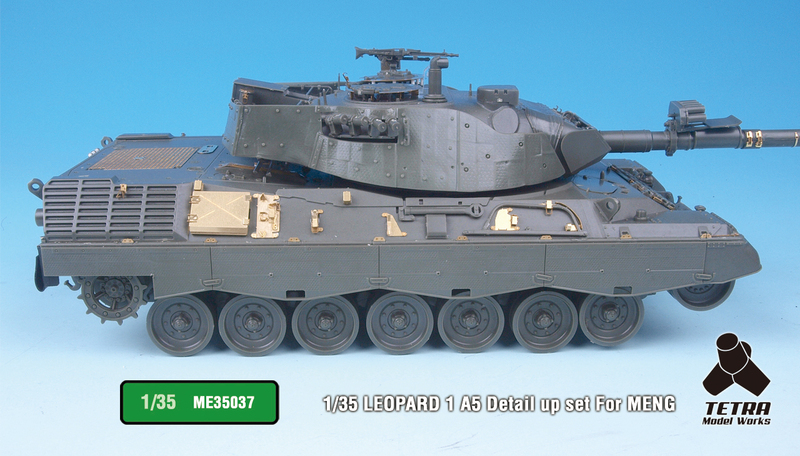 In fact, O is missing from all Leopard 1 kits. 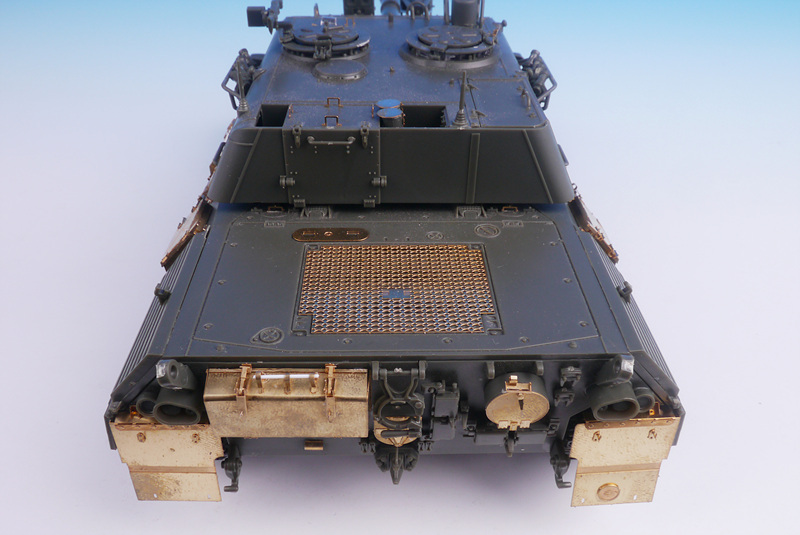 Another nice touch is an excellent representation of the grille inside the NBC filter on the left front hull top. The mud flaps are complete with the hooks for folding them up and also reflectors detailed on both sides of the flaps. The flap fret is thicker than the other two frets for a more scale thickness. 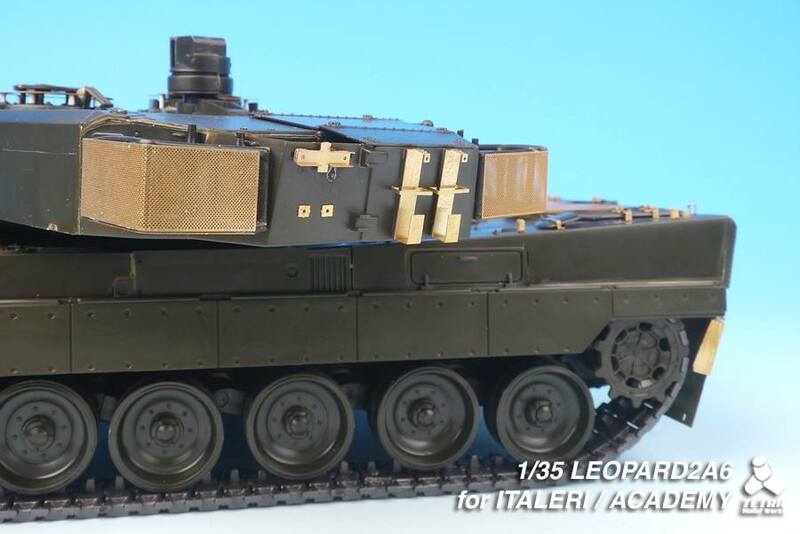 I am surprised the cupola rings are missing here especially as they are included in the Leopard 2 set. One thing I do not understand is why Tetra have included the lower grille for the rear deck. The plastic kit part is perfectly good and gives a far better feel of the cast grille than the flat etch part supplied here. 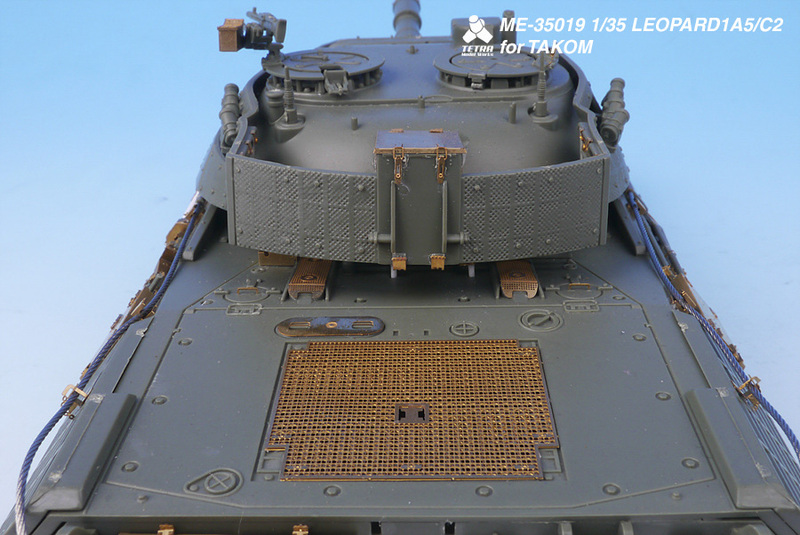 This part might also interfere with the top mesh grille which goes on top (from the Meng kit and NOT supplied by Tetra). I also don't understand why the searchlight or telephone box need etch doors. The telephone box will certainly be enhanced with the brass hinges and handle, however, if you can cope with them. Flat handles for filler caps on the rear deck when wire would look much better. 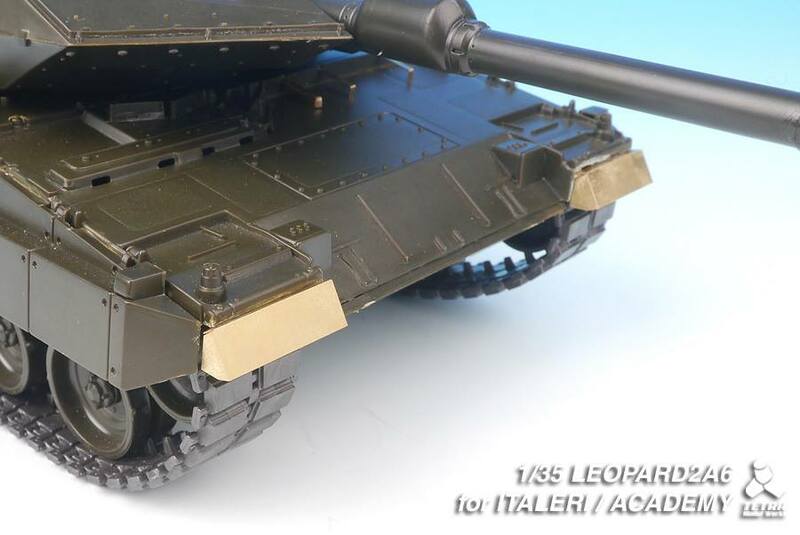 More flat handles are given for the turret roof top (part A28, 7 of them) but as I have never seen these on a welded Leo turret, I wouldn't worry about them! 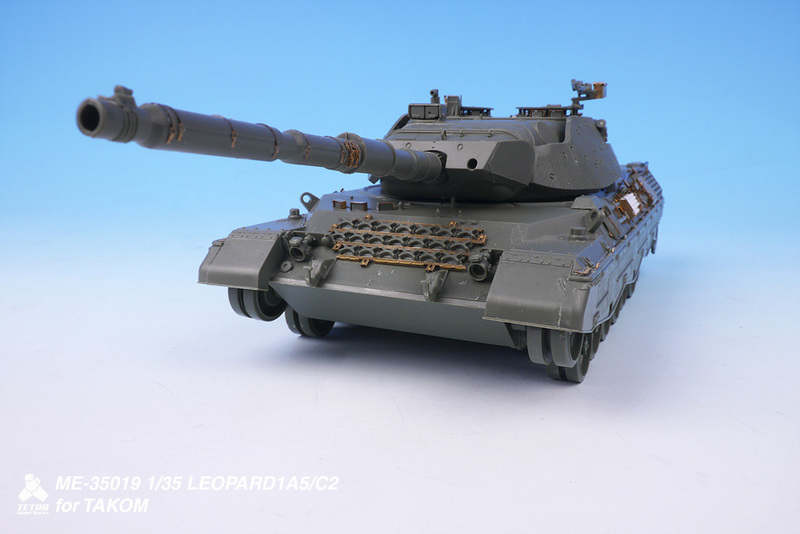 Positives - More complex out of necessity than the Leo 2 set. This is a simple, practical set, not overly complicated. 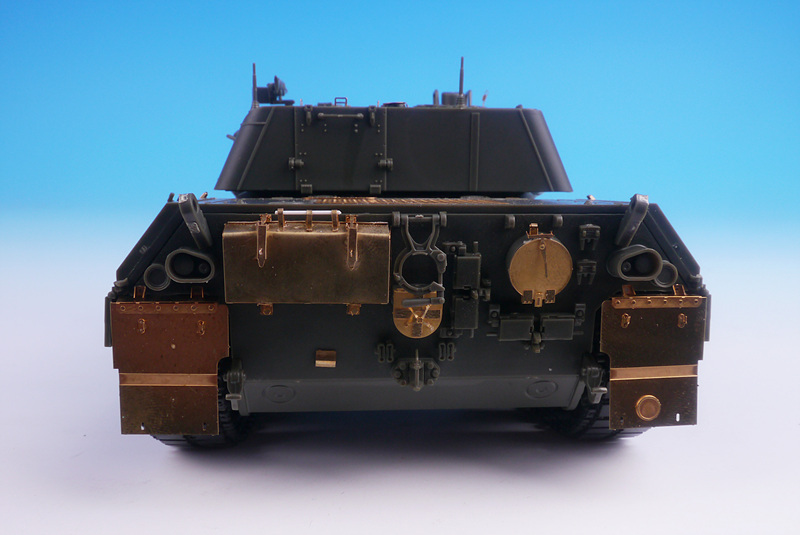 Negatives - The convoy 'shield', the bottom layer of the rear deck grille, the use of etch for simple flat doors, flat handles where wire is better. 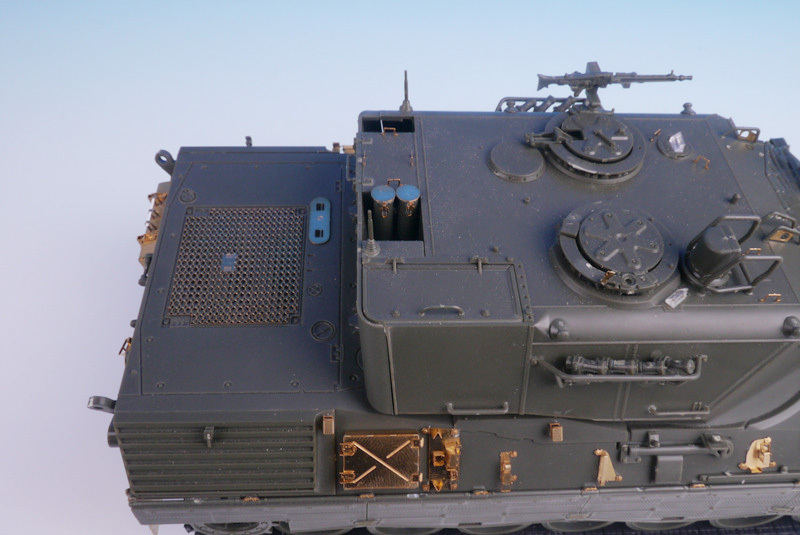 A surprising omission are chains for the smoke launchers - now available from Leopard Workshop as LW026. Conclusion - A good set, with just what you need for that little bit of extra detailing - much better than some of the over complicated sets on the market - although some might think this is complicated enough! 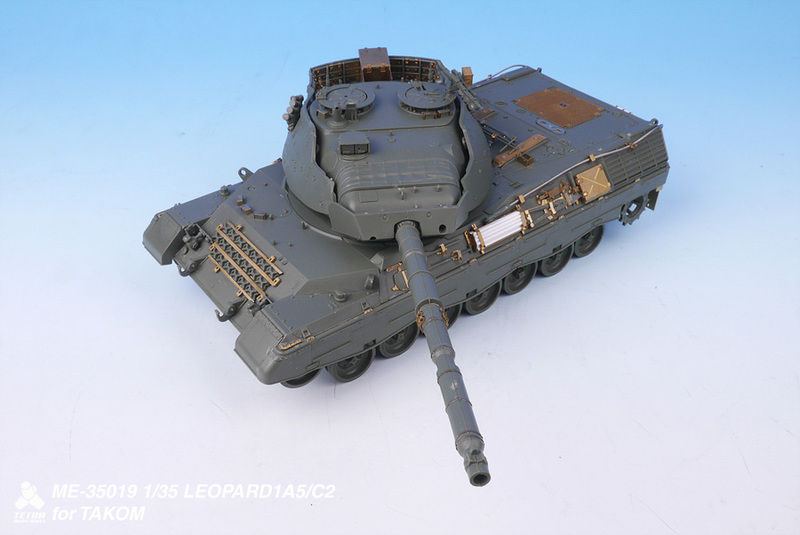 Unfortunately, that is the nature of the beast if you want true detail on a Leopard with external tool stowage. 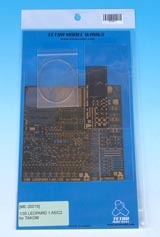 This set too has three etch frets and also a length of braided wire for a tow cable. The items on the etch frets are almost identical to the 1A3 above. 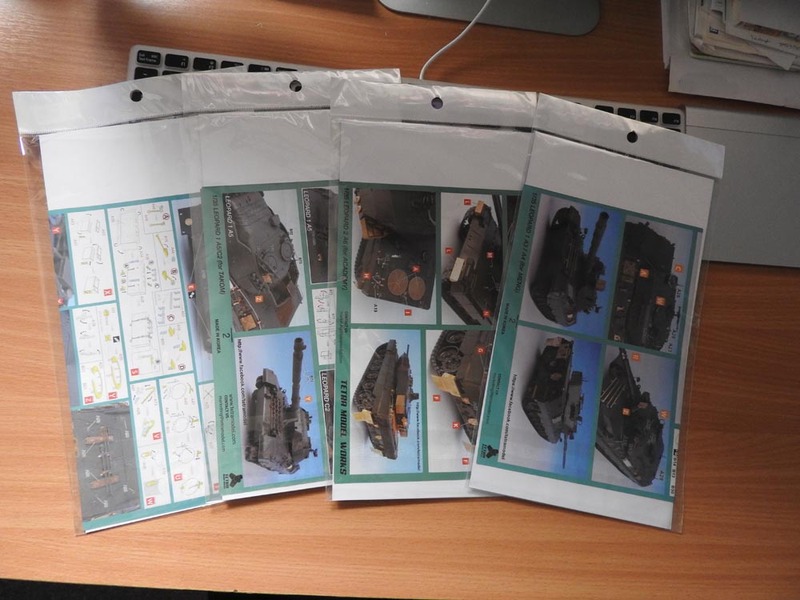 These include all of the tool clips, barrel thermal sleeve clips, rear deck grilles (upper and lower level this time), machine gun locks, rear mud flaps, convoy 'shield', hull side and rear tool boxes, grouser racks, telephone box door and some tow cable clips. 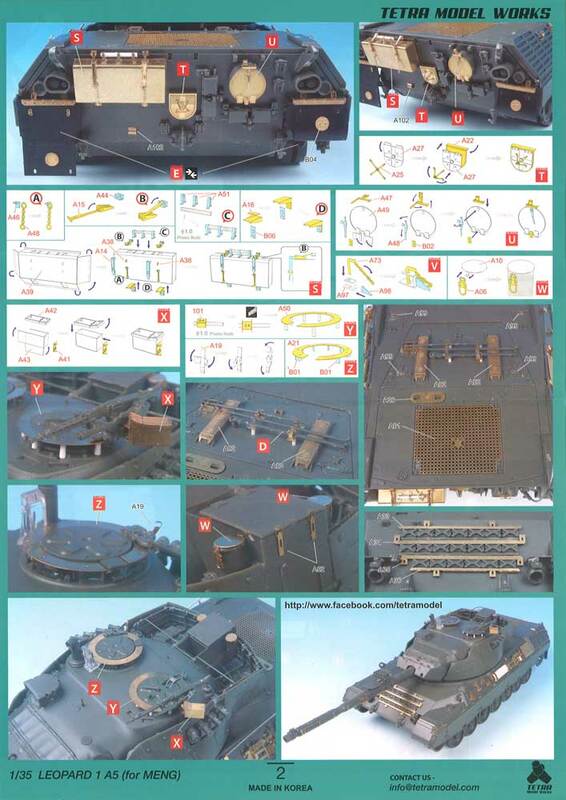 These are all relevant to 1A5 with the addition of a new rear turret searchlight box mount, door and hinges and brackets for the add-on armour that attach around the turret basket. 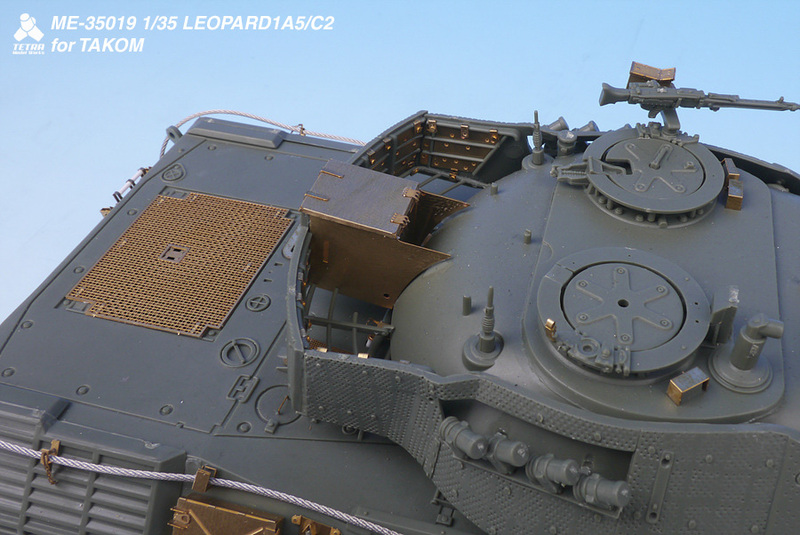 Specific additions for the C2 are all of the hull mounts for the MEXAS blocks, a second machine gun travel lock, jerrycan holders and straps on the turret rear, mesh for the turret luggage racks, tie-downs and a few other small odd and ends. The wire braid is too short to cut in half to make two cables as it is only 220 mm long. 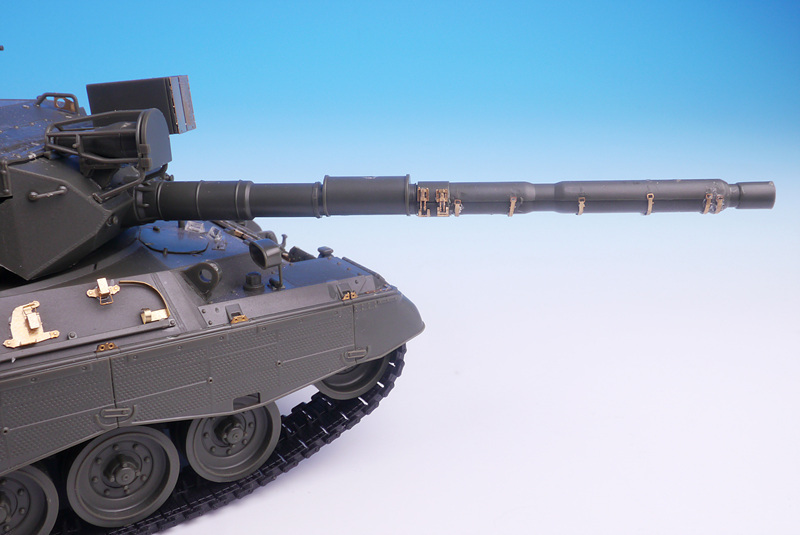 One Leo tow cable is 140 mm long, so it is 60 mm too short. 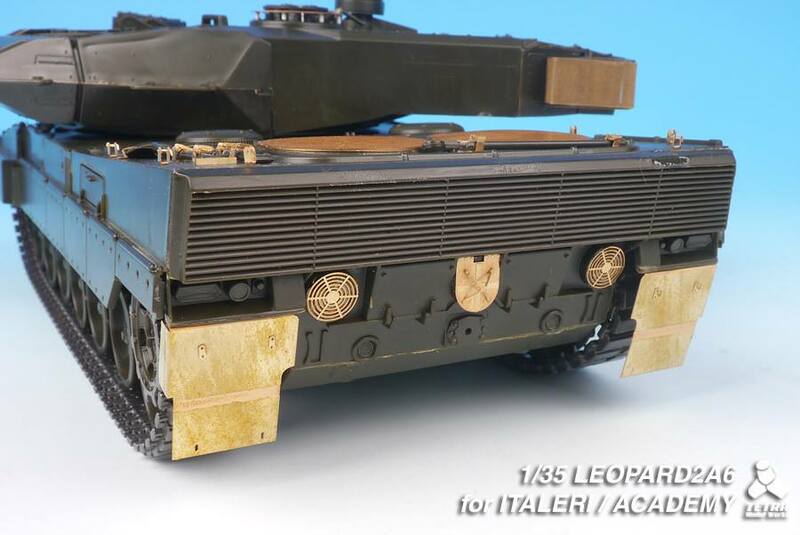 On Leopard C2, the cables cross over at the rear or circle around over the exhaust grille, not like they are shown in Tetra's instructions. However, I did find one photo of a C2 with short cables but this is not the norm - and 1A5 also had longer cables. 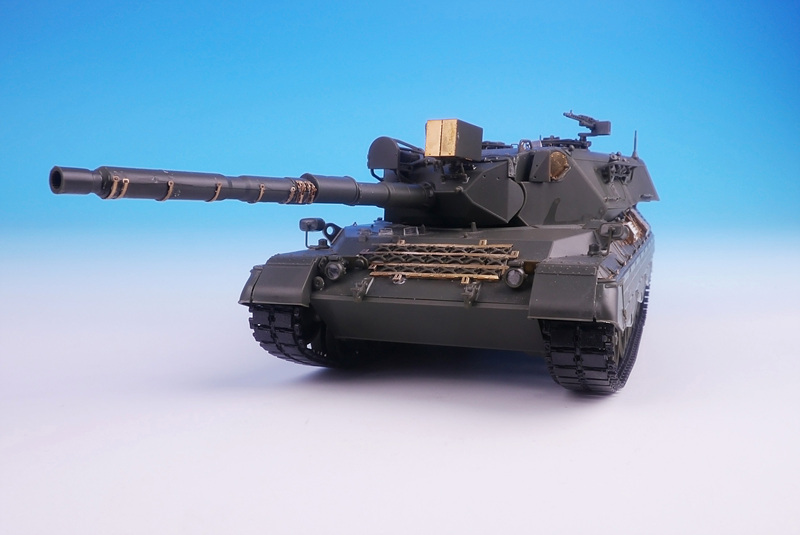 A full set of brackets are included for the gun barrel, but Tetra have made the same mistake as Takom in showing the forward thermal sleeve straps going over the top of the barrel. They should go underneath. 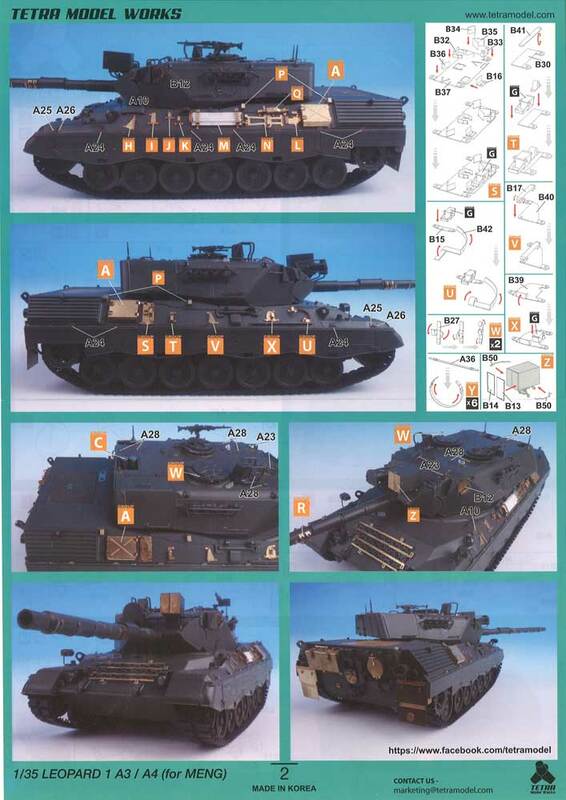 Some of these items look quite involved, particularly the rear hull tool box and those on the sides. 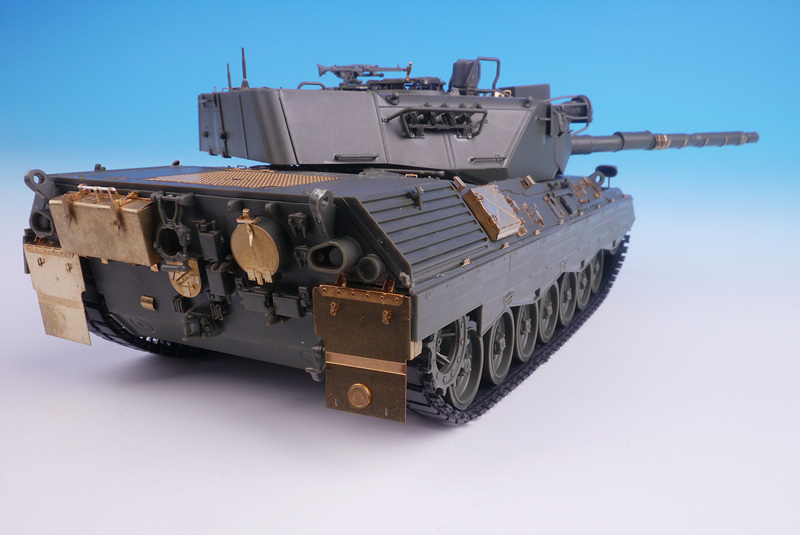 However, just the brackets and clips could be more easily used on the plastic kit parts. The hull side boxes have slots in the folds which will have to be filled, as do the grouser racks - don't like. 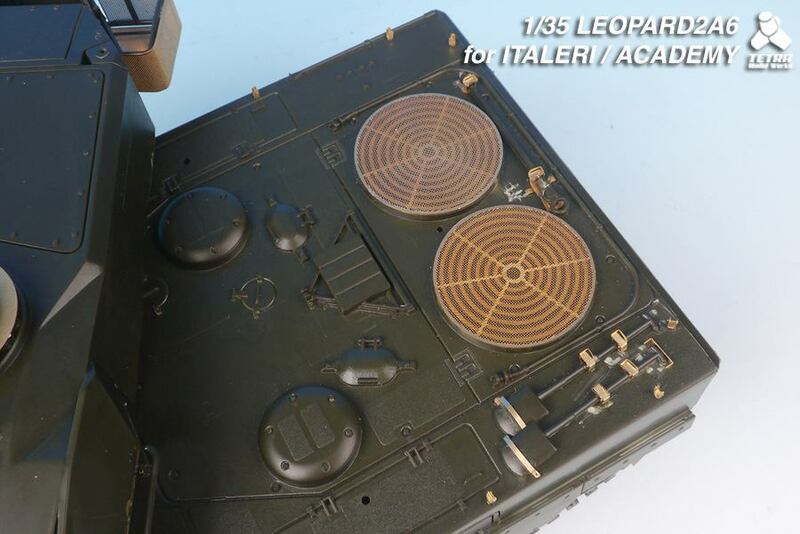 The rear tool box handle (the top one) on the Takom kit is atrocious! This time the convoy 'shield' is the right size. 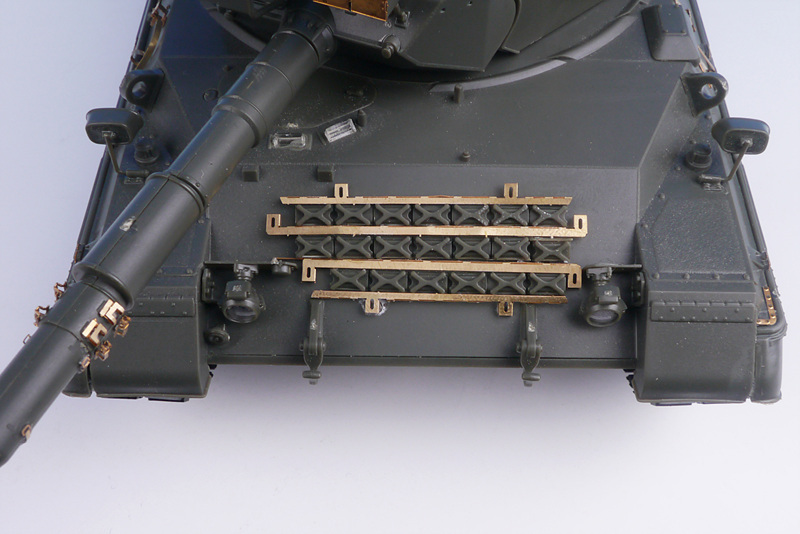 For the 1A5, the brackets that hold the add-on armour inside the turret basket are a nice touch - made even nicer by rectangular panels that slot in between the basket tubes to hide plastic ejector marks. I like the tow cable cable brackets - parts A58. 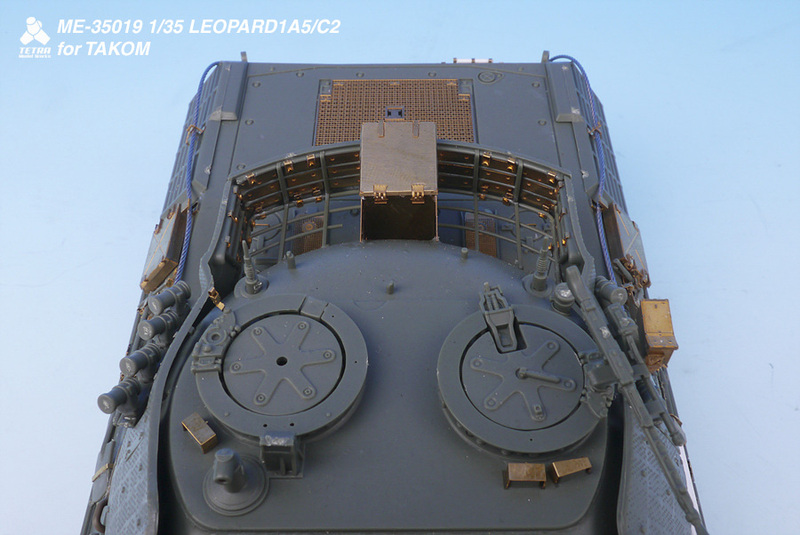 Another nice touch is an excellent representation of the grille inside the NBC filter on the left front hull top. 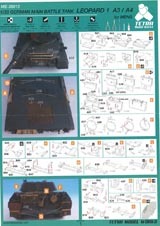 The rear deck grille is supplied as two parts this time. The plastic kit part for the lower grille is perfectly good and gives a far better feel of the real cast grille than the flat etch part supplied here. The top grille is supplied this time, though again the kit etch is perfectly good. I also don't understand why the telephone box needs an etch door. This box will certainly be enhanced with the brass hinges and handle, if you can cope with them. Flat handles for filler caps on the rear deck when wire would look much better. 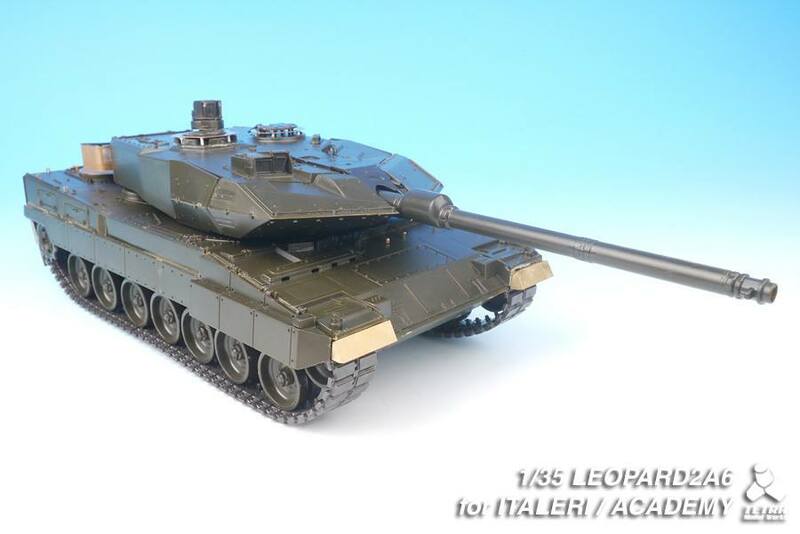 Positives - More complex out of necessity than the previous Leo 1 set as it has to cater for two different types of Leopard 1. This is still a simple, practical set, not overly complicated. Negatives - The rear deck grille, the use of etch for simple flat doors, flat handles where wire is better. Tow cables that are too short. 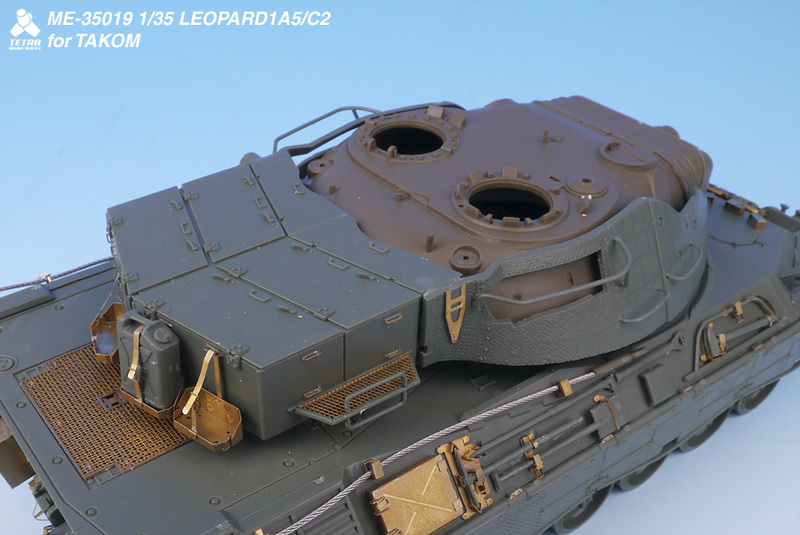 A surprising omission are chains for the smoke launchers - now available from Leopard Workshop as LW026. 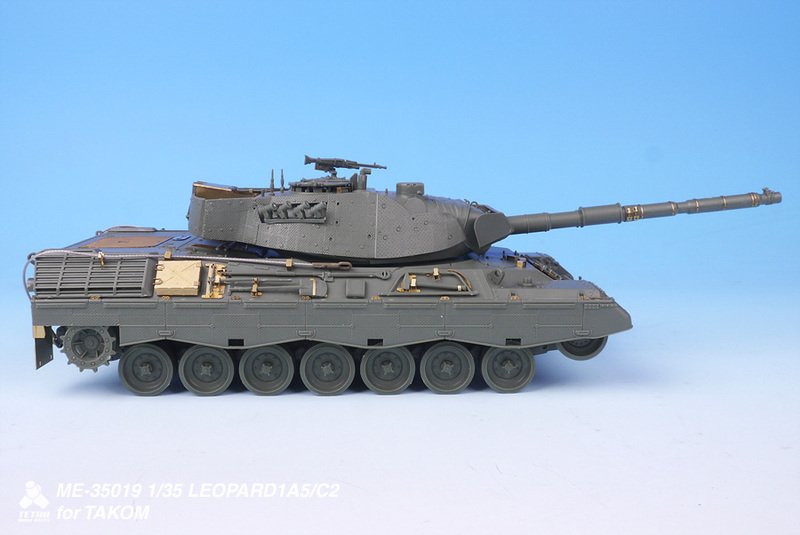 This is actually the simplest of the three Leopard 1 sets from Tetra and also the best. Tetra have learnt from the previous ones and this offering is just that bit better than before. The best part is that the etch mud flaps have been replaced by rubber ones! Yes, that's right, rubber mud flaps. It isn't much I know, but the whole feel of them is so much nicer than brass ones. All of the fittings are still the same - the brackets, hooks and reflectors, and it makes folding them so much easier and more realistic. 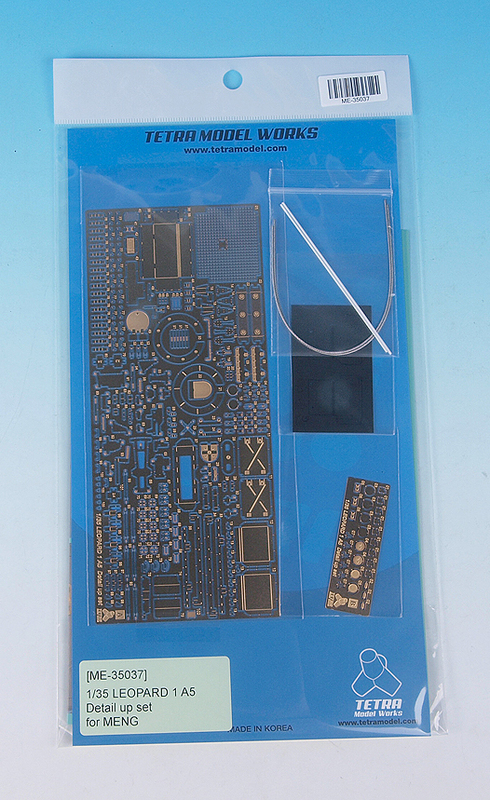 This set too has just two etch frets, two lengths of braided wire for tow cables and some lengths of plastic rod. The cables are the correct length this time, maybe just slightly too long. Better that than too short. Because the mud flaps have disappeared from the etch frets, we now have one large and one smaller fret instead of the two in the previous Leo 1 sets. 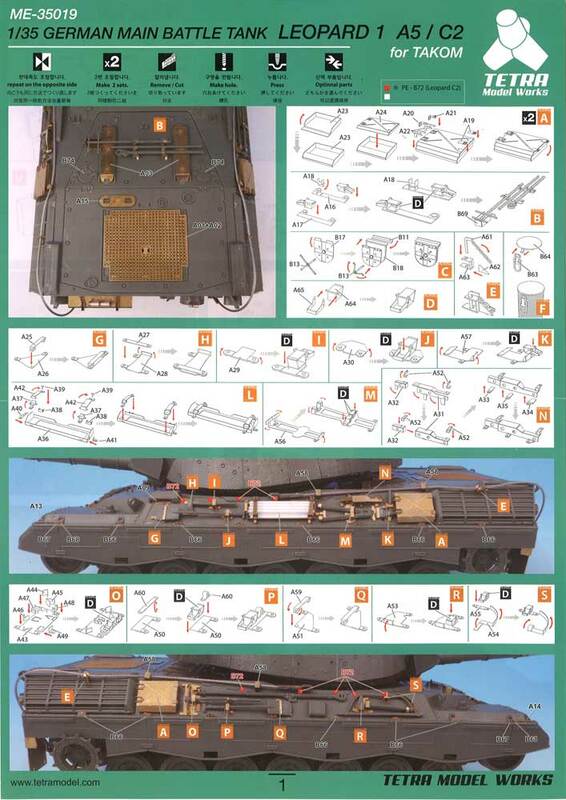 These include all of the tool clips, barrel thermal sleeve clips, rear deck grille (lower level only), machine gun locks, rear mud flaps, convoy 'shield', hull side and rear tool boxes, grouser racks, telephone box door and some tow cable clips. 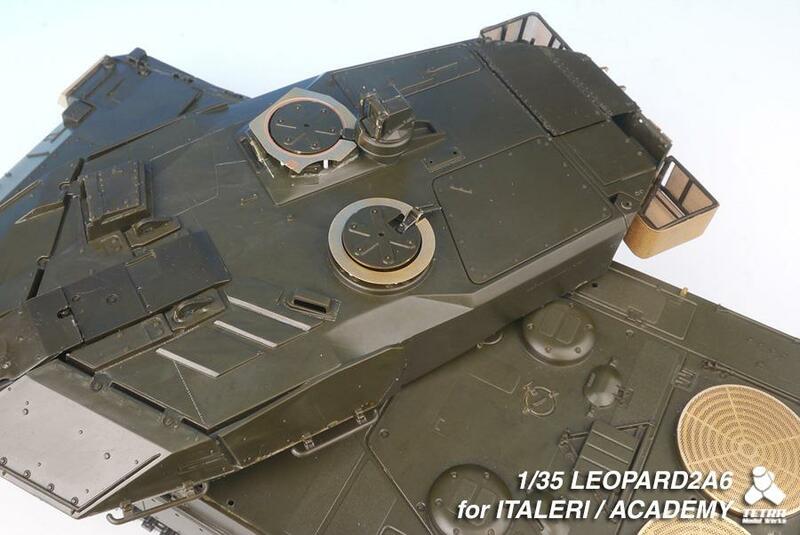 Cupola rings are included this time. To use the tool brackets, the kit brackets will have to be carefully removed from both the tools and any mounts/location points of the hull as well, or the tools sourced from somewhere else without any clips. The brackets themselves are simple four sided affairs to which is attached the handle. Looks nice and simple unlike some of the overdone 'working' clips on the market. Some of these items look quite involved, particularly the rear hull tool box and those on the sides. 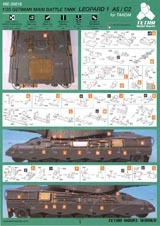 However, just the brackets and clips could be more easily used on the plastic kit parts. 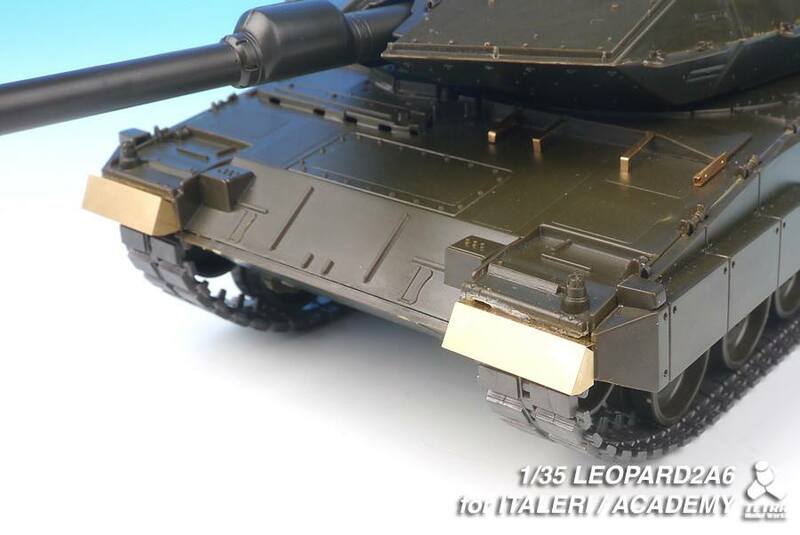 The rear box handle (the top one) on the Meng kit is atrocious! 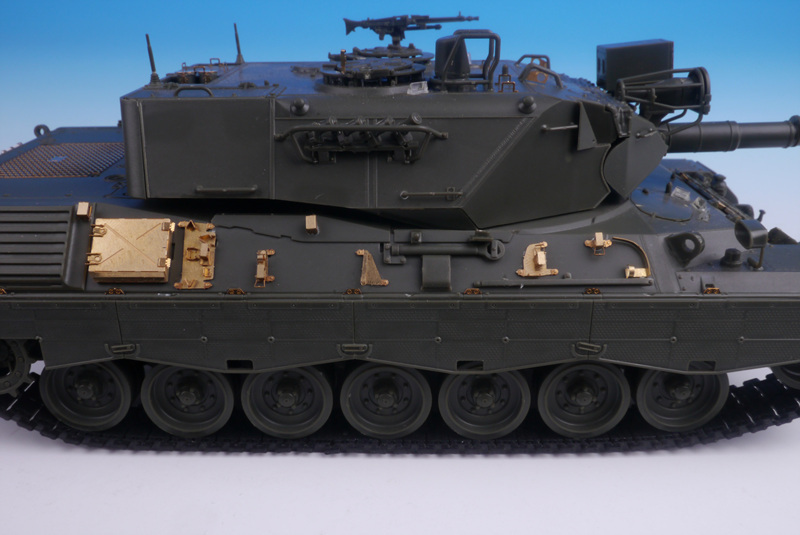 This time the convoy 'shield' is the right size. Also changed are the hull side tool boxes that no longer have slots along the folds. I like the tow cable cable brackets - parts A96. 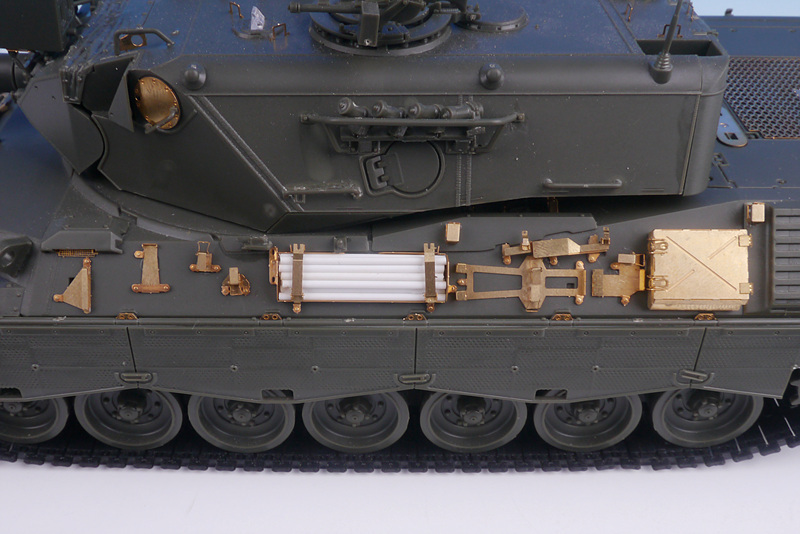 Another nice touch is an excellent representation of the grille inside the NBC filter on the left front hull top. The mud flaps (in rubber don't forget) are complete with the hooks for folding them up and also reflectors detailed on both sides of the flaps. One thing I do not understand is why Tetra have included the lower grille for the rear deck. 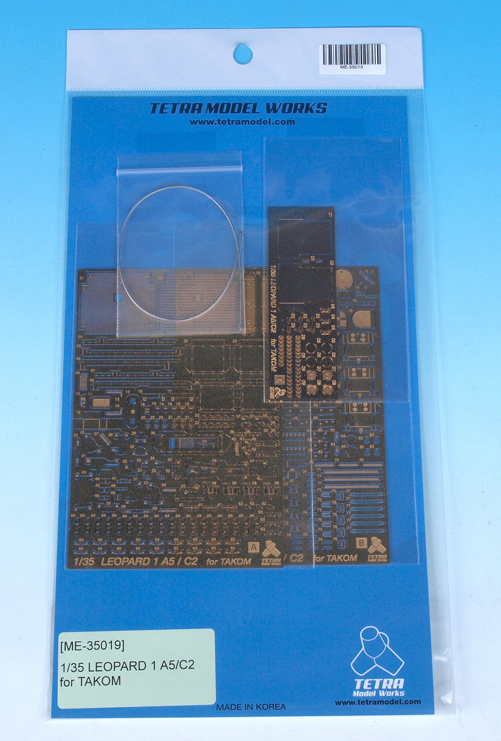 The plastic kit part is perfectly good and gives a far better feel than the flat etch part supplied here. 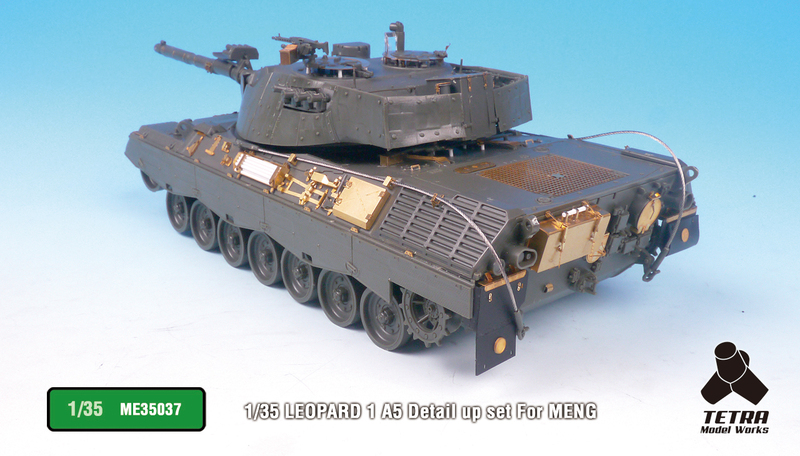 This part might also interfere with the top mesh grille which goes on top (from the Meng kit and NOT supplied by Tetra). The telephone box will certainly be enhanced with the brass hinges and handle, if you can cope with them. I don't understand why it needs an etch door though. Flat handles for filler caps on the rear deck when wire would look much better. Positives - Actually a better set than the previous Leo 1 sets. This is still a simple, practical set, not overly complicated. Cupola rings a good addition. Rubber mud flaps are inspired! Negatives - The rear deck grille, flat handles where wire is better. 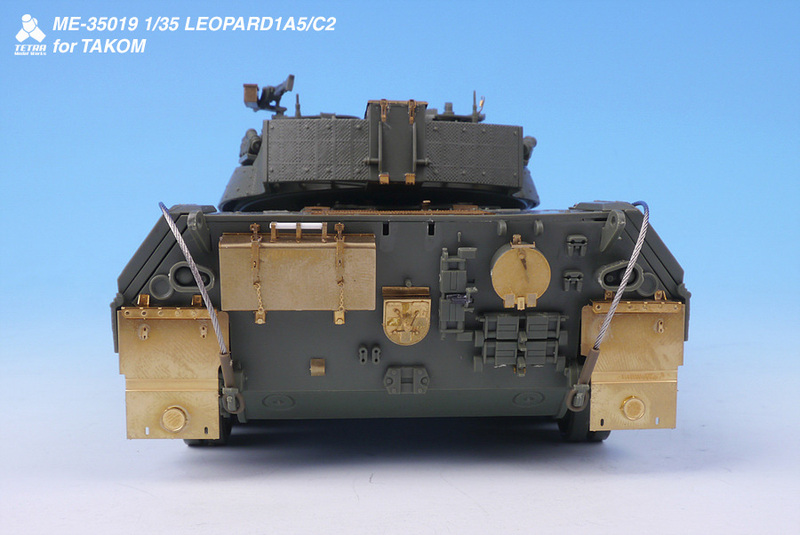 A surprising omission are chains for the smoke launchers - now available from Leopard Workshop as LW026. 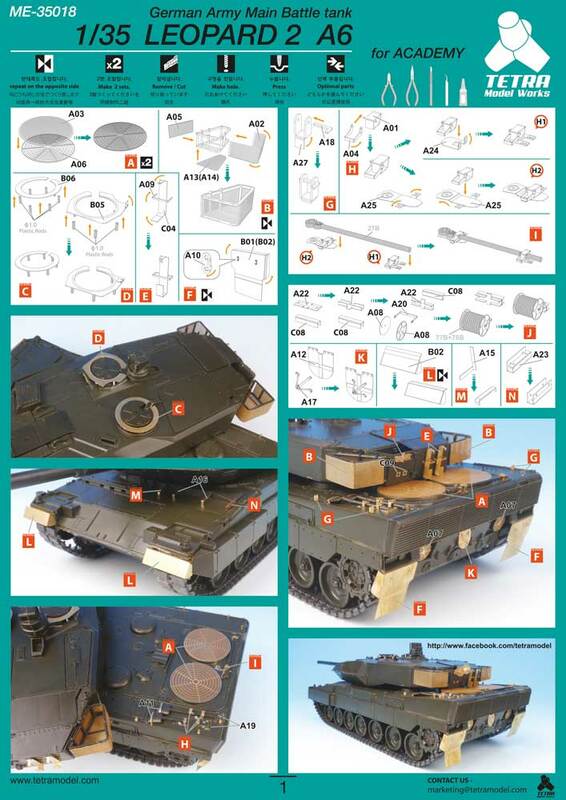 Conclusion - A better set, with just what you need for that little bit of extra detailing - much better than some of the over complicated sets on the market - although some might think this is complicated enough! 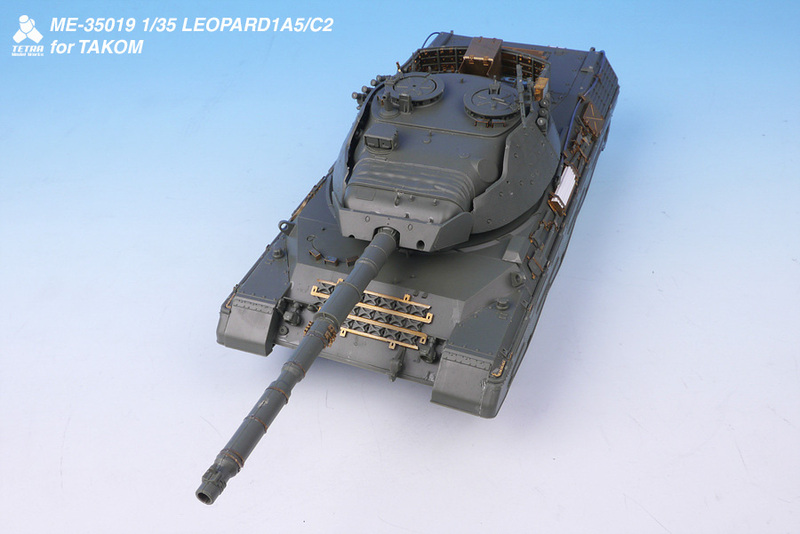 Unfortunately, that is the nature of the beast if you want true detail on a Leopard with external tool stowage. Mud flaps brilliant.